Rake's creative director Clive Darby had Robert Redford on his mind for A/W 2014, but more specifically the ruggedly handsome actor's role in the 1969 film Downhill Racer in which he played an American skier roving the Tyrolean mountains of Austria. 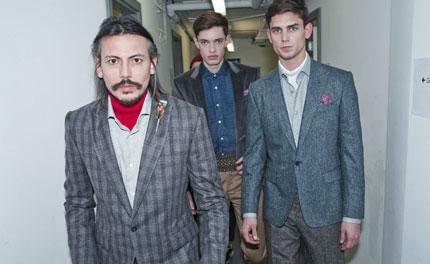 Despite the literal strain of cropped lederhosen which made a brief runway appearance, the alpine reference blended subtly through the array of textures and pale winter colour palette of the collection, with mealy greys and mustard tones grounded by deep brown deerskin jackets. Pheasant feathers adorned several looks, appearing as lapel pins and a long, dangling keychain suspended at the hip.